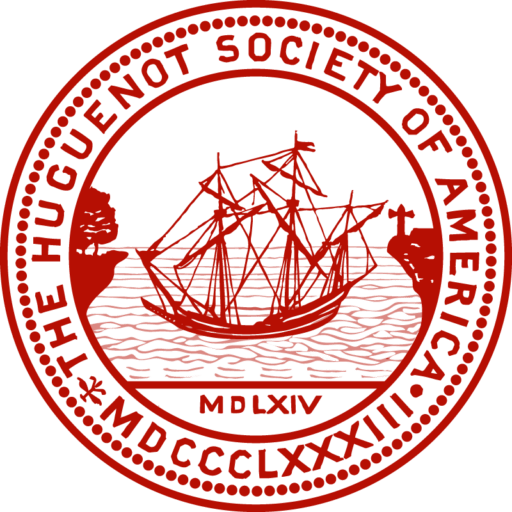 The Library of the Huguenot Society of America, located at its headquarters in New York City, is open by appointment. The Society’s Library has an on-site card catalog, which is not available online, that includes records for all books, pamphlets, and manuscripts in its collections. Researchers may contact the Office Manager to inquire if the Library holds specific research material. One of the main objectives of the Huguenot Society of America, as expressed in its constitution, is “to commemorate the principal events in the history of the Huguenots, and to this end … to gather a library composed of selected books, manuscripts, pamphlets, pictures, and other material relating to Huguenot history and genealogy.” Within a year of the Society’s founding meeting on April 12, 1883, the members began to assemble such a collection. John Jay, the Society’s first president (1883-1894), and Mrs. Martha J. Lamb, first Chair of the Library Committee and a noted historian, were key figures in the early establishment of the Society’s library. They arranged for the collection of books and objects to be housed at the Columbia College Library located at Madison Avenue and 49th Street where it was accessible for study and reference. In 1894, when the Society took its first permanent rooms at 105 East 22nd Street, the library was installed there. Initial acquisitions were primarily gifts from the founding members and their friends; although, a number of the most valuable tomes were secured by purchase with monies from the Library Fund. John Jay presented fifteen old and rare volumes. These books included Louis Maimbourg’s Histoire de Calvinisme (1682) and the Theodore Beza Greek and Latin New Testament (1574). It is well known that the history of the Huguenot people is replete with phases and facts and touches in its course, not only religion, politics, invention, the arts and sciences, statesmanship and families, but it embraces nearly every branch of learning known to the province of letters. The seeds for a unique and invaluable collection had been planted and were being fertilized. The second Chair of the Library Committee was Mrs. James Lawton who was the Society Secretary and head of the Pedigree Committee. In 1919, an updated, expanded library catalogue was printed at Mrs. Lawton’s expense. In 1961, the Society published a catalogue or bibliography of the holdings in the library. In recent years, the library acquired twenty-nine books in memory of Beverly Christy, the Society’s Executive Secretary (1981-1993) and member of the Society. During her tenure, Mrs. Christy arranged for David R. Whitesell, then a graduate student at the Columbia School of Library Science and later at Harvard’s Houghton Library, to organize and catalogue books in the collection. Over the years, both contemporary and vintage books and papers have been added to the collection. Today, the library contains approximately 10,000 objects dating from the sixteenth century to current times. The library’s scope remains broad, encompassing the history of the Huguenots, accounts of their sufferings and successes as refugees, descriptions of settlements in adopted countries, genealogies, biographies, theology, and literature. The collection also chronicles the affairs of the Society through its minutes, correspondence, membership documents, scholarship and grant applications, and financial records. The founders of the Society, with early guidance from John Jay and Mesdames Lamb and Lawton, did a remarkable job in creating the core of what is now a significant body of reference material and artifacts. New acquisitions continue to be added to the collection. These resources are available to scholars and researchers by appointment at the Society’s headquarters in the General Society of Mechanics and Tradesmen Building at 20 West 44th Street in midtown Manhattan. To determine if a university, public library, or special library near you has material, we recommend that you do a Web search using WorldCat, the union catalog of libraries in the United States and abroad.